NASA has an elaborate roadmap for the journey to the red planet, but will it actually work? Astronauts, governments, and even everyday people have been eyeing Mars for quite some time now, and talk of a manned mission to the red planet has reached a point where serious questions need to be asked. A Congressional Committee recently argued that the trip to Mars is completely unfeasible, blasting NASA scientists for even thinking they could make it work by their stated goal of sometime in the 2030s. But what will it actually take to get send the first humans to Mars? While NASA may lack the funding for such an elaborate mission (Congress estimates that it would cost over $1 trillion in investments before the trip is even possible), they certainly don’t lack the brainpower to figure out the logistics. NASA’s plan to send humans to Mars is extremely elaborate, and is outlined in a 36 page report on their website. The agency wants to extend human presence deeper into the solar system, and it believes that Mars offers the best shot for doing so. NASA’s top officials have stated that they want people to be able to work, learn, operate, and live sustainably for extended periods of time on the red planet. Much of the work being done in preparation for an eventual Mars journey is taking place currently on the International Space Station. Working together with 11 other space agencies, NASA’s research activities align with the Global Exploration Roadmap, a framework that outlines how humans may one day extend their range beyond the confines of the Earth. NASA’s key strategic principles for space exploration seek to make the journey as feasible and worthwhile as possible. Most importantly, the agency is trying to be realistic about their funding – they want a near-term budget that could be implemented to achieve actual results, and they want to be assured that this funding will be available for longer time frames. NASA also seeks to further our understanding of worlds outside of the Earth, by applying high technology and continuing to develop tools that will be essential for man’s survival away from Earth. Most importantly, NASA wants to get the ball rolling and keep it rolling. The agency has a number of near-term probe launching projects that will keep our interest in Mars strong, hoping that one day their progress will help the first human step foot on the red planet. 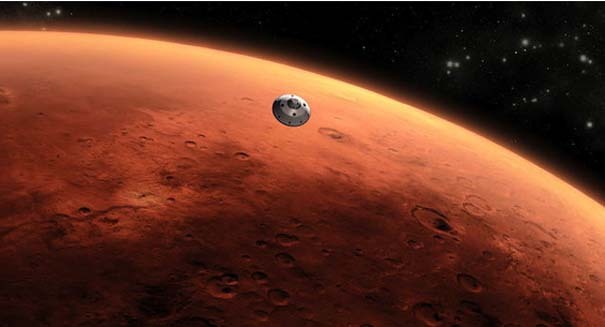 A NASA press release describing the nuts and bolts of a manned Mars mission can be found here. than one percent as thick as the Earth’s.